7/23/2011. This is the date Rltr. John R. Petalcorin (Realter Society Founder and Patent Owner) conceptualized and defined the new word REALTER and recorded it in Notary Public of Marikina City the Intent to Register as intellectual property. 8/5/2011. This is the date the Realter Patent Owner started using the Realter and its abbreviation Rltr as professional title. The first REALTER trademark registration application is lodged on 5 August 2011, under the Servicemark name of “REALTER”, with an IPO application number 42011990251. 12/19/2011. With a new logo design, Realter Patent Owner lodged another application to IPO PHIL and was given IPO application number 42011990441. 12/26/2011. Realter Patent Owner received a favorable Registrability Report from IPO PHIL for Application number 42011990251. Application published in IPO PHIL e-Gazette to open it up for opposition. 3/19/2012. Realter Patent Owner received a favorable Registrability Report from IPO PHIL for Application number 42011990441. Application published in IPO PHIL e-Gazette to open it up for opposition. 4/17/2012. Realter Patent Owner responded to IPO PHIL, requesting consolidation of application numbers 42011990251 and 42011990441. 8/1/2012. Realter Patent Owner received Notice of Allowance from IPO PHIL. 8/16/2012. Realter Patent owner paid the fees for publication and registration. 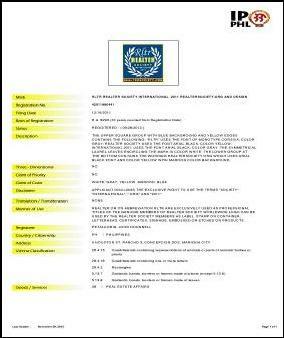 Realter trademark application 42011990441 published in IPO PHIL E-Gazette to open it up for oppositions. 9/28/2012. IPO PHIL adjudicated the application and Realter Society becomes officially registered as a copyrighted Servicemark in IPO PHIL with IPO Registration Number 42011990441 Registration is renewable every ten years. RLRT REALTER IPO Registration Number 42011990441 in JPG file. RLTR REALTER IPO Registration Number 42011990441 in PDF file. Search Trademark information of RLTR REALTER at IPO-PHIL Website.